Marion L. Butz (86) beloved wife to the late Harold for 63 years, mother of 4, LeeAnne (Jeff) Kornbau, Ned (Jessica) Butz, Laura (Vincent) Kotowski and Amy (John) Kamstra and 9 grandchildren, John, Greta and Oliver Butz, Emily, Samuel and Riley Kotowski and Jacob Kinney, Hutchinson and Maggie Kamstra. She was the daughter of the late Lawrence and Marion (Caldwell) Myers, passed away April 12, 2019. Marion was born in Johnstown, PA and grew up as coal miner’s daughter in Nanty-Glo, PA. with her 3 siblings. 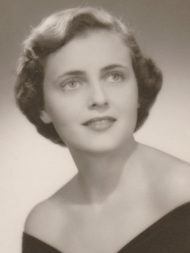 She graduated from the University of Pennsylvania Nursing School in 1953 where she met and married Harold. They settled in Lancaster and have been lifelong residents of Manhiem Township. Marion was a nurse at both the Lancaster Osteopathic Hospital and Lancashire Hall Nursing Facility for many years. Marion’s love of antiques brought she and Hal to purchase the Antique Marketplace as owners for over 22 years. Her expertise was in both textiles and glass. They both loved the antique community of friends, which became their extended family until her death. As a grandmother she hosted Camp Grandma every summer that included Friday night variety of songs and plays, art auctions on Thursday evenings and field trips throughout the week. Finally, everyone who knew Marion could not forget the annual sandtart baking event, the hundreds of hats she knitted, the family cook book she wrote, her love of travel and as an avid Phillies fan. A Memorial Service will be held on Saturday April 20, 2019, visitation at 10:00 am and a service at 11:00 am at the Charles F. Snyder Funeral Home & Crematory, 3110 Lititz Pike, Lititz, PA. Please omit flowers. My sympathy to the family. I had the pleasure of helping Marion while working for Landis At Home. She so loved her family, the Phillys, cooking, and antiques. Words cannot express the sorrow I feel for your loss.